Saw Mill (pre 1920's, steam powered)! "Saw Mill (pre 1920's, steam powered)"
This soundtrack could serenade most any size saw mill, as long as it has a steam power plant. All the usual suspect machinery has been scratch built and is in operation here. Work is done in shifts, punctuated by whistles. Between shifts you can absorb the quiet ambiance of the mill pond and surrounding forest, or listen to the wind in the trees. There are several shifts of various lengths, but each portrays a prototypical saw mill shift sequence. Listen closely and you will hear the crew, the boiler firing, the pulleys and belts come up to speed, the green chain, the debarker and saws... then the whistle signals and everything slowly grinds down to a complete stop... its been scratch built to. 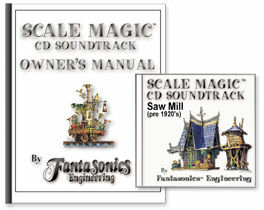 CD includes day and night scenes, all with our scratch built proprietary Scale Magic imaging.